If you’re lucky, those days feel like minutes. 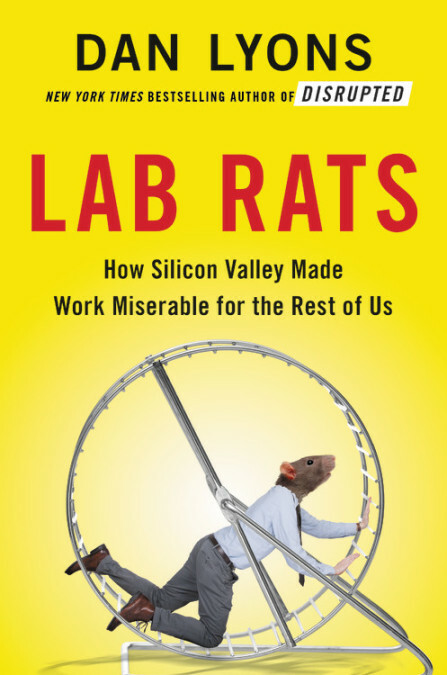 If not, well, read the new book “Lab Rats” by Dan Lyons, and you’ll know why they call it the Rat Race. On a recent “sunny and warm” California morning, Dan Lyons sat in a café playing with Legos. He wasn’t with a child while he was doing it; he was with an adult woman who runs corporate workshops, and toy blocks are the latest tool thought to alter employees’ brains so that they might work better. Thanks largely to Silicon Valley, Lyons says, Lego Serious Play and other such programs are embraced by major corporations in an effort to wring the last possible ounce of productivity out of their employees. It started more than 150 years ago when businessman Frederick Taylor thought he found a “scientific method” of extending the efficiency of his employees. It didn’t work, but Taylor became a “guru” of sorts. Over the years, he was followed by a number of men who likewise thought they’d discovered the Holy Grail of Grindstone. That was fine when we toiled with our hands. Today, though, we work with our heads. -- The feeling of being dehumanized at work. Those are the things that make employees feel infantilized and traumatized. Those four tendencies have hurt major corporations, sometimes badly – and yet, he says, there are solutions and there’s hope. Fair warning: you may need an extra set of hands around while you’re reading “Lab Rats.” You’ll need them to help pick your jaw up off the floor. Indeed, the author slaps tale after tale down on the pages of this book with the impact of a butcher throwing slabs of meat on marble. That will make workers cringe – especially if they’ve been-there-done-that – but will it make CEOs notice? “Lab Rats” is quite negative toward the tech industry. It’s not generally friendly to big business, and it’s not complimentary at all toward modern corporate programs du jour, so getting this book into a C-Suite may be a hard-sell. That might be the point. In many ways, Lyons says, chaos, brain-altering and new ways of working are not working, and it’s time to step back. Workers might agree. CEOs who’ve come around to that same conclusion might be ready to see what’s inside this book. If that’s you, then let “Lab Rats” set you square.